(Courtesy Utah Highway Patrol) A dump truck is stopped atop the mangled remains of a pickup truck it collided into Friday, Oct. 19, on State Route 40, near the Jordanelle Reservoir. Six people were killed in the crash, which troopers believe was caused by impaired driving. 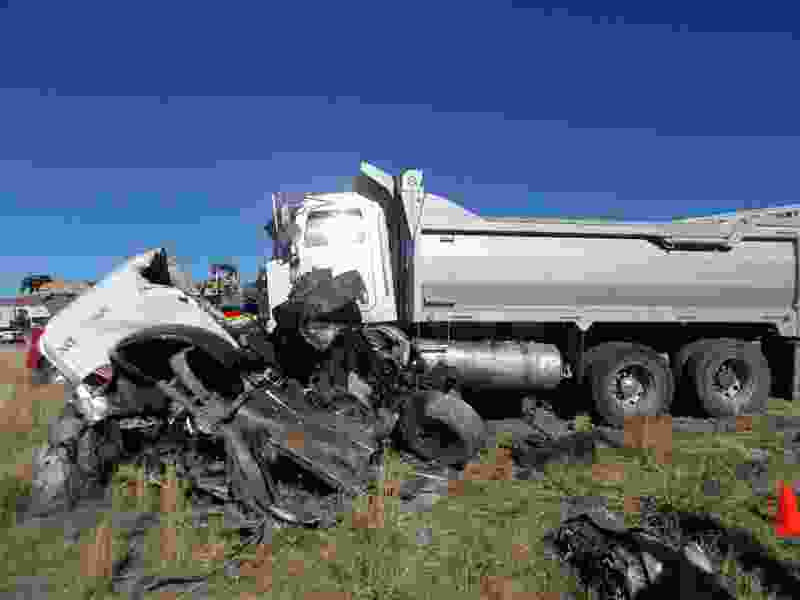 Utah Highway Patrol troopers suspect the driver of a dump truck that crashed Friday, killing six people, was intoxicated at the time of the collision. Just before noon, the westbound dump truck veered at freeway speed into the median on State Route 40 near the Jordanelle Reservoir. The dump truck vaulted over the median landing on the other side and colliding with an eastbound Dodge Ram pickup truck, Sgt. Lawrence Hopper said. Hopper said six people people were inside the pickup truck — three were ejected — and they all died. Police said all the victims are men, Hopper said. The driver of the pickup truck was later identified as 62-year-old Efrain Cardenas. An eastbound Jeep also crashed when it swerved to avoid the collision and rolled. The two people inside were hospitalized with minor injuries, Hopper said. The dump truck driver — identified through jail records as 41-year-old Jamie Don McKenzie — was treated at a hospital and then booked into Wasatch County jail on suspicion of six counts of automobile homicide. He was driving the dump truck to deliver dirt for a Park City company, according to jail records. Before the crash, troopers had gotten multiple calls about the dump truck swerving and cutting off other vehicles. Troopers later found open containers of beer and liquor in the cab of his truck, in addition to prescription medication. Hopper said troopers smelled alcohol on the man’s breath. McKenzie told police at the hospital that he drank alcohol the night before the crash but hadn’t drunk any that day. Correction: 5:42 p.m. • An earlier version of this story misidentified the driver of the dump truck as the deceased driver of the pickup truck. It has been corrected.